This building used to be the Terminal Warehouse Co.'s Central Stores, located at the foot of 27th and 28th streets, North River. Moses King's Photographic Views of New York (1895) includes a photo of the 11th Ave. side of building (click for image). There is also an advertisement for the Terminal Warehouse Company. 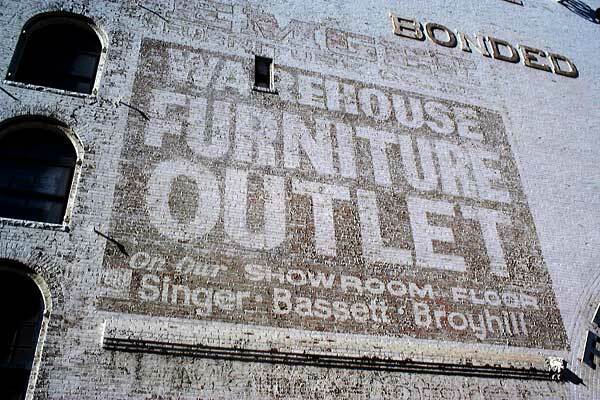 The Emgee Furniture Co. was located at 21 W. 14th St. from 1965 to 1988. Apparently they used this building as a warehouse outlet. The owner of Emgee was Myron Grabisch.